tablecloths, all with brilliant results. sit while you iron. In addition, the ironer has maneuverable rollers for quick and effortless transportation and folds away neatly for easy storage. Perfect for homes, B&B’s, small inns, restaurants and cafés. Do you demand a high personal image, reflected in the smart, sharp appearance of your business and casual wardrobe? Are you someone who aspires for a perfect, pressed look to your dining area and garments? 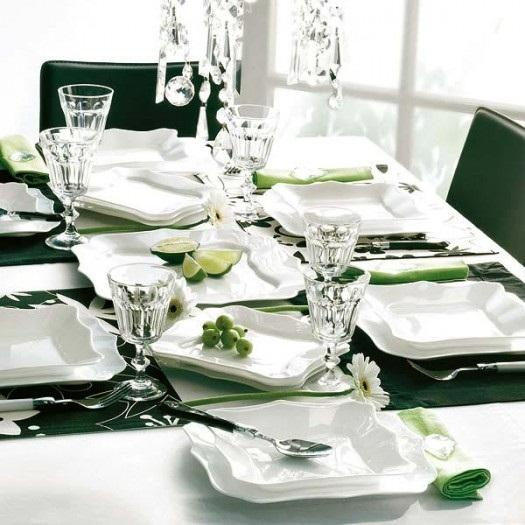 Do you want to set the perfect table, with the most elegant arrangement, perfect napkins, and a wrinkle-free tablecloth? If so, Miele has the solution. Treat yourself to professional results and ironing in luxury with the Miele HM 16-80 rotary iron. This easy-to-use appliance utilizes a wide press roller, allowing you to press everything from shirts and pants to bed linens and tablecloths—all with a crisp, professional finish. The electronically-controlled roller speed can be adjusted to suit the type of laundry being pressed, as well as your own individual working speed. This function is easily operated through the use of a foot pedal, allowing you to sit and relax while you iron. Miele is a German manufacturer of high quality commercial equipment, and is able to enforce the highest standards on its products by manufacturing all of its products in its nine privately-owned factories. Sit and iron in comfort with the Miele rotary iron. Its versatile operation will enable you to give all your ironing a smart and professional finish. While the rotary iron has design features comparable to much larger, industrial machines, it has specifically been designed for home use. Thanks to its clever fold-away mechanism and wheels, it can be stored in many places. The wide roller was designed for versatility and easy of ironing. The expanded width allows greater control over efficiency and speed, allowing you to press everything from shirts and pants to bed linens and tablecloths. This unique product gently presses delicate lace or puts razor-sharp creases into pants. The open end of the roller is particularly useful for ironing awkwardly shaped items such as shirts and blouses, which can be fitted over the open end without having to be being folded. 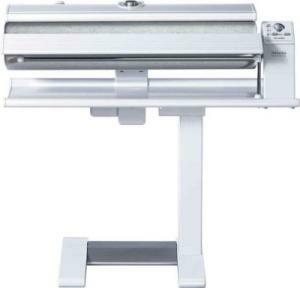 The open end also allows for easy ironing of very wide items, such as sheets and tablecloths. A simple yet all too absent function of iron presses, the swing out bar is designed to speed up your ironing, allowing for quick and easy manipulation of your clothes. Furthermore, it collapses down with the rest of the machine for easy storage. Easy control of the device comes from the touch-sensitive foot pedal, a large bar built across the bottom of the HM 16-80 Rotary Iron for convenient access. The temperature range is marked by dots and fabric controls on the ring around the temperature selector. These correspond with the international fabric care symbols for ironing. One dot is for the minimum temperature setting which is perfect for synthetics; two dots for mid-range temperature, ideal for woolens and silks; and, three dots for the highest setting... perfect for linens and cottons. A glimpse of the machine in operation. This special safety function kicks if your fingers come too close to the heater plate. This automatically stops the roller rotation and lifts the heater plate off of the roller. Do you remember the Original Mangle press from the 50's? Reliable Verve (same as Singer Pfaff 580) Rotary Steam Press now with Steam, has adopted the same exclusive and original features of open on both ends of roller and bottom instead of top ironing shoe placement as Ironrite had before they were discontinued. The Miele Rotary Iron Press is a new take on the older Mangle press models from the past. The Miele Rotary Iron Press is similar to the older Mangle press models from the past. A Mangle (as it is called in the UK) or Wringer (as it is called in the USA) is a mechanical laundry aid consisting of two rollers in a sturdy frame, connected by cogs and, in its home version, powered by a hand crank or electrically. While the appliance was originally used to wring water from wet laundry, today mangles are used to press or flatten sheets, tablecloths, kitchen towels, or clothing and other laundry.